Hail Baishakh 01, 1426. A new year has dawned today and new hope surges in the breast as the first lark tears through the crimson glow of the eastern sky. We have bidden a tearful goodbye to 1425. In a sense every parting is tearful, but literally the last couple of days of the bygone year were shadowed by evils as news poured from here and there that some twisted men sexually assaulted women. Our hearts cringed with pain as one of victims of sexual assault in Feni, who was later set on a fire for filing a case, succumbed to her burn injuries. Therefore, one of the most pressing agenda of the year is certainly the fight against the evil shadow of sexual and male-chauvinist violence. We must fight beastly behaviour of some among us through a movement of social awakening, cultural regeneration as well through ruthless enforcement of law. We owe it to our mothers, sisters and daughters; we owe it to the nation. Any progress in this regard is being most anxiously watched by the entire nation. The inaugural day of the Bengali year holds a special place in our hearts. It is always refreshing to feel that we have left behind the old and are now ready to start afresh. Though we cannot begin everything anew and will continue doing most things which we have started at an earlier point of time, the New Year is a kind of a new chapter in the ledger of life. It evokes a nice feeling of freshness and helps us focus on realising our unfulfilled hopes and aspirations. Come O Boishakh come upon us. Let teardrops vaporize and fade into the distant skies. Pahela Baishakh is the biggest cultural festival of the country and the celebration of the day in a grand manner is a sign of national unity. On this day, we the Bangladeshis, irrespective of our difference in faith, ideology, class and caste, converge on the basis of cultural harmony to usher in the Bangla New year. Thus Pahela Baishakh not only unites communities but also is a melting pot of rich and poor. On this day, we wear the same traditional dress and eat the same food – panta, bhorta, ilish and red chilli, and dance to the tone of folk songs. The celebration of Bangla Nababarsha defines who we are. No matter where we live and what our religious or political ideology is, our common identity is – if we are human being first then we are Bangalee. Our religious leaders might misunderstand us and our political pundits might get us wrong, but whoever says what the fact is one can change his/her religious or political views over time, but can never change his/her ethnic identity. Religious and political affiliation can be separate parts of our identity but neither of these are our only identity. The increasing tendency of seeing people in terms of religious or political identity dominantly (this is your duty as a Muslim or Hindu, you must commit this as an Awami Leaguer or BNP follower) has been responsible for driving deep division in society, even in families. One may like to take liberty in deciding which identity will s/he prefer, but we must not lose sight of our root. Traditionally, the people of this country have been religious but secular. This is the core substance of Bangalee culture. Pahela Baishakh just symbolises this secular ideal. We have suffered exploitation and colonisation for long. Our deep-rooted cultural heritage had been held hostage by the colonial and new-colonial powers. The Pakistani rulers disfavoured any secular culture of the people and gave no official recognition to Pahela Baishakh celebration. Yet the rural masses celebrated the event in their own way through organising agricultural fairs, sports and festivities. The Language Movement of 1952 was not only a struggle to re-establish the rights of Bangla speaking people but also saved our cultural identity from extinction. Then in 1971, Father of the Nation Bangabandhu Sheikh Mujibur Rahman helped us win nationhood which also helped quicken the process of reestablishment of cultural identity of the Bangalees. After liberation the people found in Nababarsha the fulfilment of their secular cultural urges and it is being celebrated with ever greater fervour (though at the risk of fundamentalist attack). 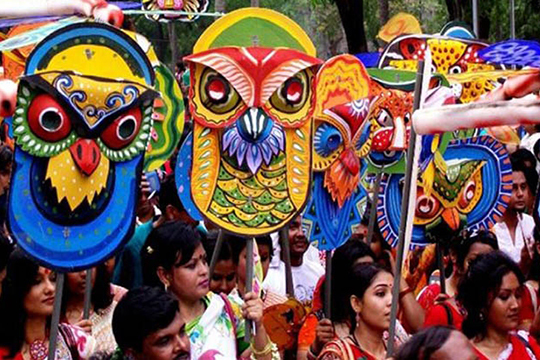 The Pahela Baishakh is the occasion to reaffirm this cultural identity with ever increasing vigour. The customary celebration of Pahela Baishakh dates back to the period of reign of the great Mughal Emperor Akbar. In its early hours the day probably did not have any particular festivities, apart from clearing off all financial dues. All the subjects of the emperor were required to pay their taxes by their final day of ‘Choitra’ the last month of Bengali calendar so that fresh calculation could start from the 1st day of the New Year. It is said that as per the instruction of Akbar, the Islamic lunar calendar and the Hindu solar calendar had been combined to form the Bengali calendar. It is this unique quality of Baishakh that needs to be highlighted for those who would like to poke the age-old debate between culture and religion. It is, however, true that nowadays business of the country is not done on the basis of Bangabdo and most of us are hardly aware of Bangla calendar for most of the year. But even if for one day in a year let us look back to our roots and unite in welcoming the Bangla New Year. The year’s new sun brings new hope. And we are here to depict, as far as we can the sunny side of life.